DiseÃƒÆ’Ã‚Â±o y desarrollo de sitios para Internet. Alojamiento y diseÃƒÆ’Ã‚Â±o grÃƒÆ’Ã‚Â¡fico tambien disponibles. Miami. A web design firm that offers web and graphic design as well as search engine placement. Based in Miami, Florida, United States. Offers web design, development and consulting, e-commerce solutions, database design, and print services. Located in Miami, Florida, United States. Miami, Florida-based web and print design, animated graphics, banners, and IT marketing. In English and Spanish. Web development and streaming media services. Miami, Florida. Design and development services. Miami, Florida. Offers site design, e-commerce solutions, hosting and graphics design. Serving Miami, Florida, United States. Web design, graphic design, e-commerce development, hosting, and domain registration. Located in Miami, Florida, United States. Offers web design, hosting, and domain registration services. Provides design, hosting and marketing. Based in Miami, Florida, United States. Design firm based in Miami, Florida. Services include consulting, backend solutions, custom application design, E-commerce, hosting, and server co-location. A Miami Beach, USA based designer with experience in broadcast, web and graphic design. Services include: promotion, design, animation, virtual tours, domain registration, site analysis, e-commerce, language translations, graphic design, and Flash Animation. Located in Miami, Florida. Offers design, 3-D and digital imaging, stock photography, and advertising services. In Miami, Florida. Provide web design, hosting, and promotion services. Based in Miami, Florida, United States. Web site design, Flash, and e-commerce solutions. English, Spanish and French. Located in Miami, Florida, USA. Web, print and graphic design house, includes Flash, animation, 3D, and maintenance. Located in Miami, Florida. Offers web graphic design, programming, hosting and e-commerce solution. Located in Miami, United States. A consulting firm, specialized in web design, maintenance, marketing and e-commerce. Based in Miami, Florida. Offers site design, e-commerce, multimedia solutions, graphics and hosting. Located in Miami Beach, Florida. Offer web design and marketing, DVD production and print services. Specializes in Flash, SQL and database development. Based in Miami, Florida, USA. Web design, Flash, shopping carts, scripting, database integration, hosting, and promotion. Located in Miami, Florida, United States. Miami, Florida based web design company that specializes in flash. Provides web pages, CD business cards and resumes, and submittal to search engines. Offers web design, hosting, search engine registration, site maintenance, and e-commerce solutions. Based in Miami, Florida, United States. Offers web and graphic design, hosting, domain name registration, consultancy and multimedia solutions. Located in Miami in Florida, United States. Web design and development, e-commerce, database development, web hosting and search engine submission services. Located in Miami, Florida. Miami, Florida based site offers web site and flash design, web development and programming, animation, interactive, flyers, advertisements, business cards, and mixed media illustration. Search engine optimization firm based in Miami, Florida. Offers web and Flash animation development. Located in Miami, Florida. If the business hours of Silva Heeren Creative Design in may vary on holidays like Valentine’s Day, Washington’s Birthday, St. Patrick’s Day, Easter, Easter eve and Mother’s day. We display standard opening hours and price ranges in our profile site. We recommend to check out silvaheeren.com/ for further information. 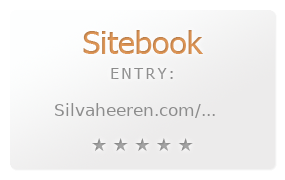 You can also search for Alternatives for silvaheeren.com/ on our Review Site Sitebook.org All trademarks are the property of their respective owners. If we should delete this entry, please send us a short E-Mail.